Rats are clever animals. They are constantly exploring and learning about their environment, and they adapt quickly to change. Because they are experts at hiding, you may not see rats in the garden, so it’s important to learn how to recognize signs of their presence. Do Rats Rummage in Gardens? Do rats rummage in gardens? Yes. Rats feed on plants and chew on ornaments and structures in the garden. Dense ground covers and hedges with branches near the ground provide hiding places, while other vegetation, garden vegetables and berries provide them with important sources of food. Where do rats live in the garden? Rats live in thick vegetation that covers the ground, such as English ivy and blackberry patches, as well as underground tunnels. You may find them in stacks of firewood and material such as newspapers and cardboard that are stacked for recycling. Construction materials, compost piles and thick mulch also provide safe havens for rats in the garden. Removing some of the most appealing hiding places will discourage some rats, but it may take poisons to completely eliminate rats in gardens. Their ability to learn quickly and adapt to change makes finding deterrents for rats challenging. Ultrasonic devices and deterrents that depend of flashing lights work for a short period of time, but the rats soon learn that they are harmless. 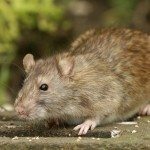 Good sanitation and removing hiding places are two deterrents that help reduce the rat population, although they may not completely eliminate rats in the garden. Smoke and gas cartridges are sometimes used against burrowing rats, but since rat burrows may be extensive and have several openings, you may end up with toxic gasses in places where you didn’t expect them. Close as many openings as you can find before trying this method. You may find that you’ll do as well by flooding the burrow with water. Rats avoid new things, so it may be a while before you catch rats in traps. If you use trapping as a part of your control program, decide what to do with the rats you trap in advance. Humane killing is a good solution, but many people find it difficult. Releasing them in another area solves your problem but may create problems for wildlife. Rats have been known to decimate bird populations in some areas. Toxic and poisonous baits are the most effective way to control rats, but they are also the most dangerous and most likely to harm children, pets and wildlife. Federal law restricts the sale of these types of baits to gel, paste or wax blocks that come in ready-to-use stations; however, the active ingredients are as harmful to other mammals as they are to rats. Pest control professionals are experts in handling and placing these types of baits.